Spring is well and truly in the air in London, particularly in our French corner of Cavendish Square, nestled behind Oxford Street. To complement the new warmer weather and longer days our Head Chef, Raphael Grima, has visited local markets and suppliers to find the best seasonal produce available. The new dishes were launched in our new look menu this week and we’re excited to hear what our valued guests think. New to the menu; White Asparagus with Maltaise sauce. The Maltaise Sauce is a classic sauce made by adding the juice of blood oranges to a basic Hollandaise sauce. It’s tangy, and a little bit sweeter than a regular Hollandaise. A must try this Spring. Sommelier Christopher Lecoufle has paired this dish, as in true Taillevent tradition, with 4 choices of wine by the glass. 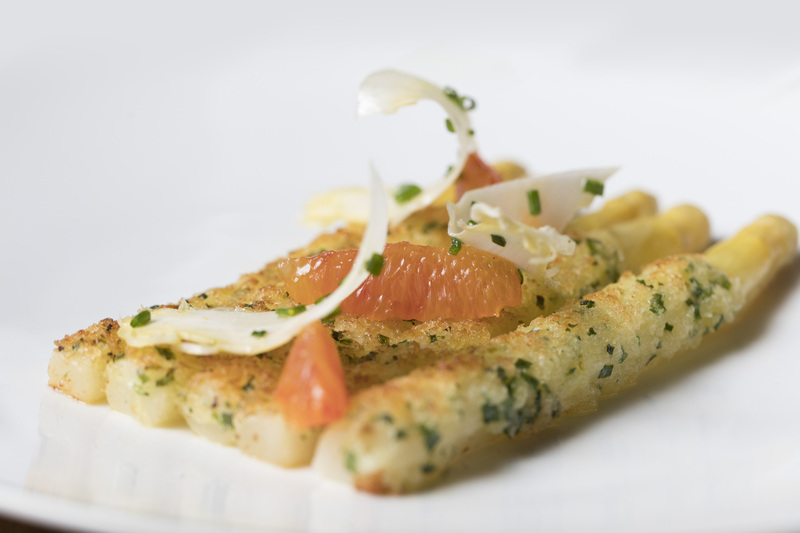 Enjoy the white asparagus with a glass of Saint Mont “Le Faite” 2010, or a Condrieu “La Loye” 2010. Take a look at our French inspired menu for more wine pairings. Asparagus, this time green, also features in our Wild Turbot main course along with courgette, radish, beurre blanc. This colourful dish has the perfect balance of the spring flavours and was a huge hit during our tasting process. Paired with an English Camel Valley Bacchus 2014 from Cornwall, eating on our Terrace, you’ll feel miles away from the hustle and bustle of Oxford Circus. For those less spring like days we recommend indulging in our new Pigeon, confit foie gras cromesquis, pea purée, peas à la Française or the Rump of lamb, roasted with mint, celery purée, lamb jus. Both new dishes are paired with some spectacular wines and we recommend asking our Sommelier for recommendations. Perfect for business lunches or a short shopping pit stop our set menu has also had a seasonal change. Try our French twist on a Caesar Salad with chicken, bacon, baby gem, and a Skate Wing, confit, courgette, rice paper chips, coriander beurre blanc. Two courses are just £20, add a Chocolate Chou dessert for another £5. Don’t forget to start your meal off with a glass of Veuve Clicquot Champagne Brut N.V. Our Champagne of the month for April. This Champagne was hand picked for the new menu and is just £10 a glass for the month. If Champagne isn’t to your taste our cellar has 1100 wines to choose from. We do hope to see you at the Restaurant, or on our sun drenched Terrace, this April. For more of our Spring Menu and the new seasonal dishes on the menu click here or follow us on Instagram, Twitter and/ or Facebook. We’re very social at Les 110 de Taillevent.